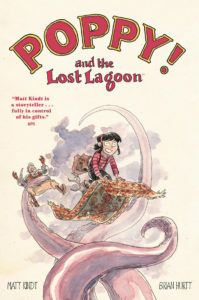 Graphic Novel Review 34/365: Poppy! and the Lost Lagoon – Dark Horse Week! While I will be doing other Dark Horse Graphic Novel Reviews this year, I will be ending the official Dark Horse Week with a gem by the creative team of Matt Kindt and Brian Hurtt. Poppy is your classic adventure story in the same vein as The Adventures of TINTIN or Indiana Jones…treasure map and all (sort of)! Poppy is a young girl who adventures with her grandfather’s old partner, Colt, swore to keep the girl safe. But as we quickly find out, Poppy is just fine on her own, and often is the one saving Colt form danger. After some quick research, I do not believe that this is a series, but it sure does feel like one, and if it is not, it should be! I’d live int his world for a few more stories. Honestly, as I was reading, I thought I was just going to be perusing you everyday adventure story. That genre never did much for me. I came around. First, I was pulled in by the coloring. Filling the pages with fantastic water-coloring, Kindt sold me. I’m a fan of water-colored books, and this one is done masterfully. So while the art kept me reading, the unique story continued to pull me in until I was swimming with delight (there is a pun there, but you have to read the book to know what I’m talking about). 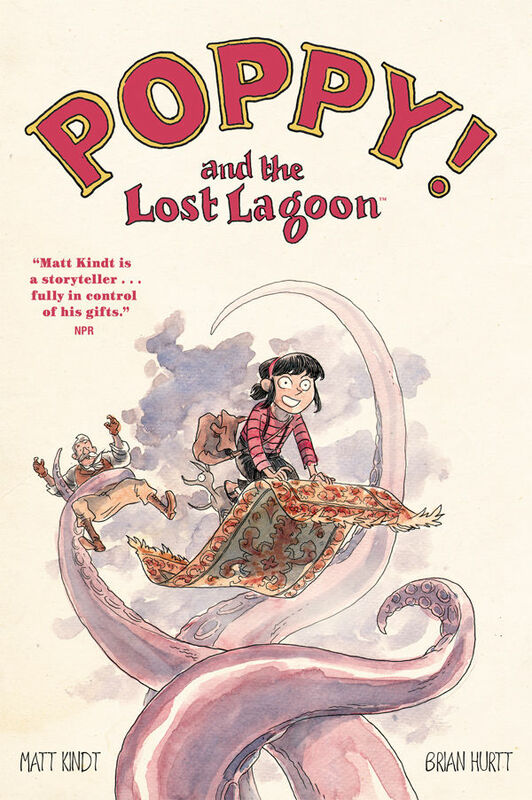 The characters are fairly typical, but being such a story-driven book, you never really care that the smart little girl and her semi-bumbling/uber-capable chaperone, accompanied by a cute cat, aren’t very dynamic. Younger kids will love the characters and story, and the adult readers will love the story…and hopefully the art. I have this book at 10+ not because it’s scary or gory; I feel that some of the plot elements and story might confuse younger readers. Like I said, this graphic novel tells a fairly in-depth story, so if you have really smart little ones, then OK. Nothing really scary here to keep it out of younger hands. I had a lot of fun writing this graphic novel review! Now, go have an adventure. And pick up a lesson or two from Poppy!